Populist presidents Donald Trump and Brazil's Jair Bolsonaro appeared to be singing from the same hymn sheet after meeting at the White House today. Trump said he was thrilled over Bolsonaro's first trip to see him in Washington and congratulated Brazil's new president on his "tremendous" election victory. He said the two leaders would have a "fantastic working relationship" and they shared many similar views, including being "true to each other on trade". 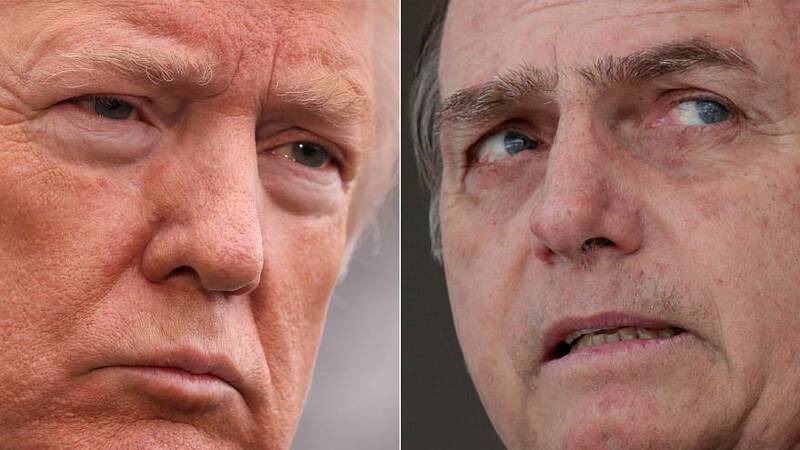 Trump touted friendship with Bolsonaro as the reason the diplomatic relations were at an all-time high between the two largest democracies and economies in the western hemisphere. "Brazil and the United States stand side-by-side in their efforts to share liberties and respect to traditional and family lifestyles, respect to God, our creator, against the gender ideology of the politically correct attitudes, and fake news,” Bolsonaro said. During their meeting prior to the press conference, the two leaders discussed Venezuela, with Trump calling Brazil a tremendous leader in supporting Venezuelans to reclaim their liberty and democracy. Trump said Brazil was one of the first nations to recognise Venezuela’s “legitimate interim president” Juan Guaido along with the US and thanked Brazil for helping with the massive humanitarian aid along the Venezuelan-Brazilian border. Trump encouraged Nicolas Maduro’s forces to step aside in order to achieve a “truly great humanitarian project” and called Maduro nothing more than a “Cuban puppet”. "The twilight hour of socialism has arrived in our hemisphere," said Trump while affirming joint US-Brasil support for the people of Cuba and Nicaragua and added there was no place for socialism in America. Additionally, President Trump said he was strongly considering NATO membership for Brazil and intends to designate Brazil as a non-NATO ally. North Atlantic Treaty Organization is an intergovernmental military alliance between 29 North American and European countries. The OECD's outlook on Brazil expects growth to gain momentum over the next two years but concerns about Brazil's being unable to fully implement reforms could lead to derailing the recovery. OECD says if reforms are achieved it will lead to stronger investment in Brazil. still found it "disgraceful" that McCain voted against repealing key parts of Obamacare in 2017. Trump "never a fan of McCain"
President Trump doubled down on his criticism of the late Sen. John McCain and said he was "very unhappy that he didn't repeal and replace Obamacare." "They got to a vote, and he said thumbs down," Trump said. "I think that's disgraceful." "There are other things," he added. "I was never a fan of John McCain and I never will be." You can watch their press conference in the video player, above.